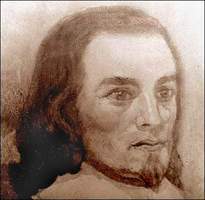 GODEFROY, JEAN-PAUL, interpreter, trading clerk at Trois-Rivières, businessman, comptroller-general of the Communauté des Habitants, naval commander, and counsellor; b. c. 1602 in Paris, of a family from Normandy; d. in 1668 or shortly before, probably in France. He was the son of Robert Godefroy, who was king’s counsellor and treasurer-general for supplementary war expenses, and, in 1627, one of the Compagnie des Cent-Associés, and of Marie Marteau, of the parish of Saint-Nicolas-des-Champs in Paris. Several historians have settled on 1626 as the date of Jean-Paul Godefroy’s arrival in New France. It is nevertheless quite possible that he came as early as 1623. Indeed Champlain, in his Voyages, speaks in that year of “a sailor named Jean Paul,” whom Laverdière identifies, somewhat hastily perhaps, as Godefroy. In any event it is certain that, even before the Kirke episode [see Sir David Kirke], Godefroy was one of Champlain’s interpreters, and returned to Europe with him in 1629. Did Godefroy come back to Quebec in 1633 as has been claimed? We do not know. But it is known that in 1636 he was at Trois-Rivières serving as a trading clerk. 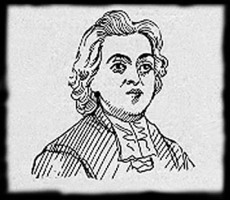 The Jesuit Relations allude to his apostolic zeal among the Indians, over whom he had great influence by virtue of his complete mastery of their language and his athletic prowess. Champlain’s erstwhile interpreter continued to interest himself in trade. In 1644 the Communauté des Habitants sent him, together with Pierre Legardeur de Repentigny, to France as its delegate to seek certain changes in the trading monopoly, and at the same time, if possible, to obtain the return to the colony of the Recollets. Although unsuccessful in the latter respect, the Godefroy-Legardeur mission did secure for the Habitants a very favourable agreement with the Compagnie des Cent-Associés (1645). We find Godefroy going to France again in 1650 to request, although with no more success than before, the return of the Recollets, to whom it was proposed to entrust all parish duties. 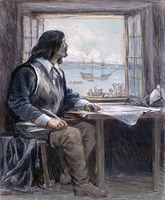 In addition to being one of the leading members of the Communauté des Habitants, of which he was comptroller-general in 1648, Godefroy maintained a personal interest in the fur trade, in sealing, and in the cod-fisheries. As the owner of at least one ship, he joined forces with Louis d’Ailleboust and Jean Bourdon in 1653 to fish for cod. Their association aimed at creating a triangular trade between Canada, the West Indies, and France. The outcome of this bold plan is, however, unknown. Being an enterprising individual and a colonial of far-ranging ideas, Godefroy was often called upon to exercise important functions: after serving as a delegate to France in 1644 and 1650, as comptroller-general of the Communauté and member of the colony’s first council in 1648, and as admiral of the fleet in 1649, he was entrusted in 1651 with the delicate mission of meeting with the representatives of the New England colonies. Since 1647 negotiations had in fact been taking place between the New England colonies and New France with the idea of establishing commercial relations. The council of New France, while favourable to the project, nevertheless insisted that the commercial agreement be accompanied by a defensive and offensive alliance against the Iroquois and such other tribes as were hostile to the Christian Indians. On 20 June 1651 the council empowered Jean-Paul Godefroy and the Jesuit Gabriel Druillettes to meet the representatives of New England in order to bring the discussions to a successful conclusion. On 30 Oct. 1651 Godefroy returned. The mission had been a failure; the English refused to fight the Iroquois. In 1652 Godefroy was churchwarden of the parish of Quebec, but after that date he is mentioned only occasionally, once in 1653 and once in 1657. It appears likely that about this time he settled in France with his wife, Marie-Madeleine Legardeur de Repentigny, whom he had married at Quebec on 3 Oct. 1646, and with his daughter Barbe. As for his second daughter, Charlotte, she was probably entrusted to the Ursulines of Quebec, in whose community she later became a nun. 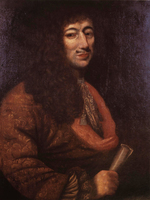 Jean-Paul Godefroy died sometime before 23 Oct. 1668, apparently in France. APQ, Manuscrits concernant la Nouvelle-France, I. ASQ, Séminaire, VI, 6a. Champlain, Œuvres (Laverdière), VI, 58. JR (Thwaites), IX, 33, 57. Papier terrier de la Cie des I.O. 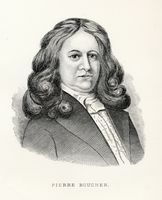 (P.-G. Roy), 272f., 276. Lanctot, Histoire du Canada, I, 272. Le Jeune, Dictionnaire. P.-G. Roy, “Jean-Paul Godefroy,” BRH, X (1904), 246–50. Benjamin Sulte, “Les interprètes du temps de Champlain,” RSCT, 1st ser., I (1882–83), sect.i, 53. André Vachon, “GODEFROY, JEAN-PAUL,” in Dictionary of Canadian Biography, vol. 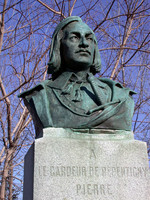 1, University of Toronto/Université Laval, 2003–, accessed April 19, 2019, http://www.biographi.ca/en/bio/godefroy_jean_paul_1E.html.